This grey tabby cat is surrounded by a border worked in rich jewel colours to give him a suitable setting. 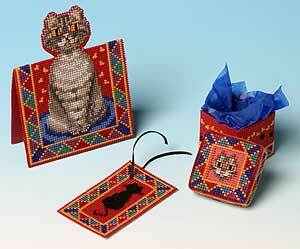 The colours and cat theme are continued in the gift box and label. The finished card stands about 12 cms high, the box about 4 cms, and the label is about 7.5 cms long.